Is The U.S.A Still A Super Power? Is The U.S.A Still A Super Power? This can no longer be considered a silly question, for when one looks at the facts, one is forced to review all the data the government is pushing down our throats. In fact, we argue that the U.S.A is not a super power. It is a third world country in many aspects, with exception that it has some very big guns. 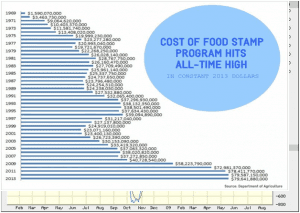 A record 20% of Households need Food stamps. 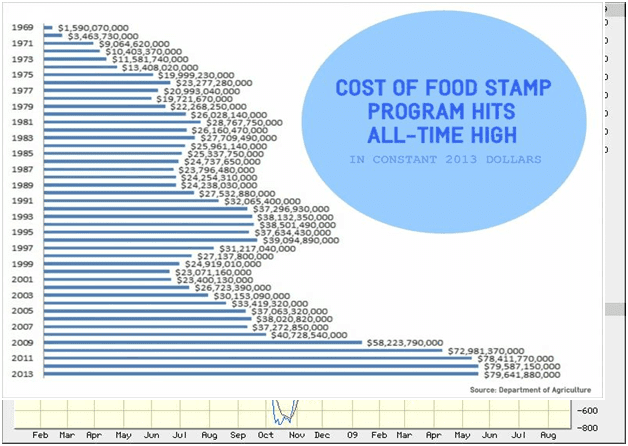 Now roughly 48 million individuals are on Food stamps. Keep in mind these are 2013 figures. The number has surged 42% from 2009. Wait a minute; was that not the year the markets bottomed and are we not in the middle of bull market and aren’t things supposed to be significantly better today? So what gives? Could the government be lying? No that is simply not possible; not this government that cares so much for the welfare of its people. 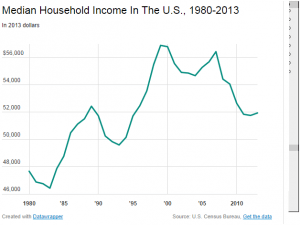 In 2013, the official poverty rate was 14.5 percent, down from 15.0 percent in 2012. 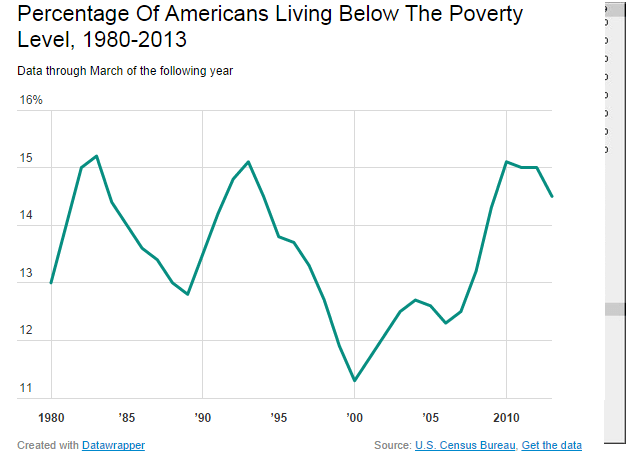 This was the first decrease in the poverty rate since 2006. In 2013, there were 45.3 million people in poverty. For the third consecutive year, the number of people in poverty at the national level was not statistically different from the previous year’s estimate. 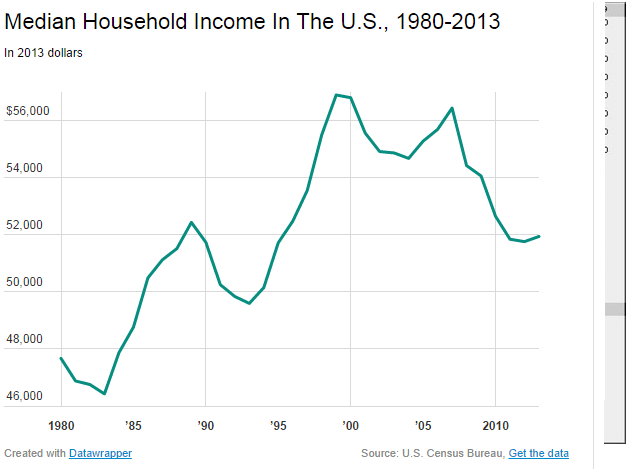 The 2013 poverty rate was 2.0 percentage points higher than in 2007, the year before the most recent recession. The poverty rate for people aged 18 to 64 was 13.6 percent, while the rate for people aged 65 and older was 9.5 percent. Neither of these poverty rates were statistically different from their 2012 estimates. 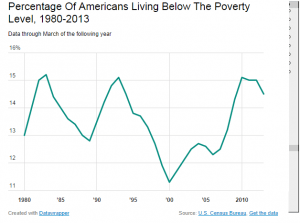 Both the poverty rate and the number in poverty decreased for Hispanics in 2013. 1 in 9 of the country’s bridges is rated as structurally deficient, meaning they require significant maintenance, rehabilitation, or replacement. Of the 84,000 dams in the U.S., 14,000 are considered “high hazard” and 4,000 are deficient. It would cost $21 billion to repair these aging dams. 42% of the country’s major urban highways are considered congested, and 32% of major roads in the U.S. are in poor or mediocre condition. Even though a third of Americans don’t drive cars, 45% of households lack access to transit. There are 240,000 water main breaks in the U.S. each year, and many water mains and pipes are over 100 years old. The Federal Aviation Administration anticipates that the national cost of airport congestion and delays will nearly double from $34 billion in 2020 to $63 billion in 2040. 90% of locks and dams experienced an unscheduled delay or service interruption in 2009. Barges being stopped for hours can prolong transport of goods and drive up prices. How is it possible that this so-called super power country is in such poor shape? All this money that was thrown at useless wars and stupid bailouts could have been used to do something really good and help keep America strong. Instead it was flushed down the toilet and the net result is that the outlook is even direr. Worse yet over 20 countries have far superior infrastructure, now that is a real slap in the face. It seems the basis for this super power status is simply big guns. Jobs should be easy to get also right. Let’s get this straight. We are in an economic recovery, the picture is rosy, all is well, but 20% of households do not have even one family member employed. What gives? What gives, is that it clearly shows you how the charlatans at the top are lying through their teeth, committing outright fraud and murder and doing this in the open. The top shadow players despise these antics and something will be done to deal with this deviation. Thus one can conclude that unemployment is not dropping; the only thing dropping is the number of people currently looking for a job. The BLS uses a twisted formula which does not count someone who is unemployed if they stop looking for a job. This means that if members of the middle class lose their job, they will have no savings to fall back on and will immediately join the ranks of the poor and destitute. Again, what world are these chumps holding positions in the government living in? Now you know why Russia and China are not only challenging the USA but they are also teaming up; they know the end is near. You cannot push other countries to the limit when internally everything is falling to pieces. In terms of health care, the USA is close to the bottom of the barrel coming in at distant 37th. Evidence that other countries perform better than the United States in ensuring the health of their populations is a sure prod to the reformist impulse. The World Health Report 2000, Health Systems: Improving Performance, ranked the U.S. health care system 37th in the world1 — a result that has been discussed often during the current debate on U.S. health care reform. And secondly that real economic opportunity for decades to come will be mostly found in Asia and other developing nations, but Asia will lead the pack. Quality of life should be very good. In terms of the happiest countries in the world, the USA is not in the top five and barely makes it in the top 10. It holds the number 10 position. 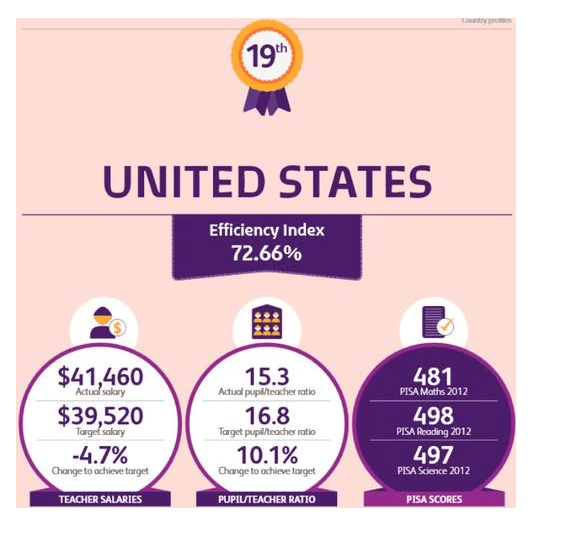 http://www.forbes.com/pictures/mef45ejmi/10-united-states/ So again by several measures the USA is far from the top. Just because we have more weapons than most nations and because we spend the most on our military does not make us a true super power. 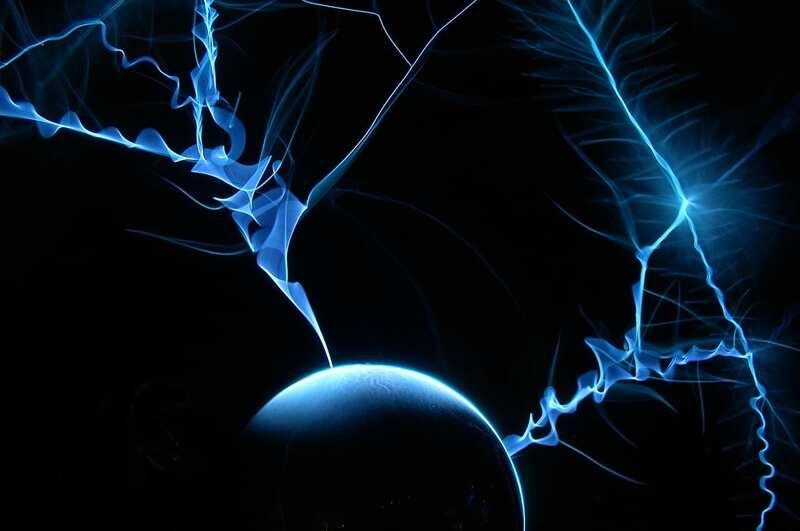 This super power status is bought with money we do not have and spent on crap we really do not need. Once the strings to the purse are closed the military will collapse as was the case with the Soviet Union. Once the petrodollar is eliminated, all these channels of easy credit will come to a grinding halt. This is what Russia and China are working on and they are doing rather well so far. Thus while the press screams that the Russia is in the Dog house, the reality is that America is already in the Dog house; the problem is that most are too blind to see it yet. If China is a paper dragon, then the USA is a paper cookie. Reality hurts and it will hit those least prepared the hardest. This article summarizes some (but not all) of our sentiments rather well. Well, yes. When it comes to violence and preparations for violence, the United States is, indeed, No. 1. In 2013, according to a report by the Stockholm International Peace Research Institute, the U.S. government accounted for 37 percent of world military expenditures, putting it far ahead of all other nations. (The two closest competitors, China and Russia, accounted for 11 percent and 5 percent respectively.) From 2004 to 2013, the United States was also the No. 1 weapons exporter in the world. Moreover, given the U.S. government’s almost unbroken series of wars and acts of military intervention since 1941, it also seems likely that it surpasses all rivals when it comes to international violence. This record is paralleled on the domestic front, where the United States has more guns and gun deaths than any other country. A study released in late 2013 reported that the United States had 88 guns for every 100 people, and 40 gun-related deaths for every 400,000 people―more than any of the 27 economically developed countries studied. By contrast, in Britain there were 6 guns per 100 people and 1 gun-related death per 400,000 people. In the end the data presented clearly indicates that the super power status is based on the assumption that the USA will be able to borrow unlimited amounts of money forever. This sadly is a delusion of the highest order. The only reason America has been able to pull this stunt off for so long is because of the petrodollar and additionally because all commodities are priced in dollars. This will end sooner than later. When it does the ability to print unlimited amounts of money will come to a grinding halt.